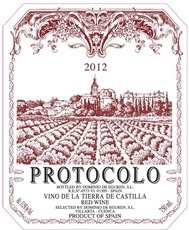 Wine Dominio de Eguren Protocolo Tinto 2016 - Royal Wine Merchants - Happy to Offer! Dominio de Eguren is part of the Sierra Cantabria family of wineries, and is one of the oldest and most prestigious of their properties. The winery was founded in 1870 and has continued to be managed by the Eguren family for five generations. The style of winemaking is characterized by clarity of fruit, power, structure, and freshness.